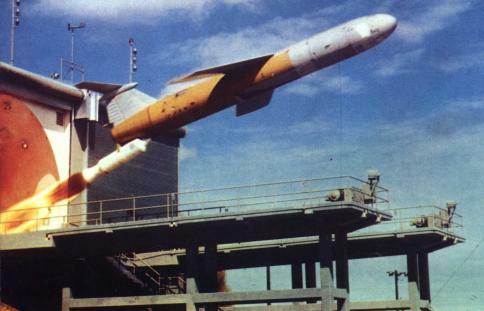 The Mace was a development of the TM-61 Matador missile, and as such was initially designated TM-61B Matador B. The main reasons for the new development were the Matador's radio-controlled guidance system, which was limited in range and easily jammable, and the fact that the Matador missile system was very cumbersome to move and set up for firing. The Mace missile had redesigned airframe, with smaller wings and a longer fuselage. The larger internal volume increased range to about 1300 km (800 miles). Additionally, the missile was transported fully assembled (except booster) on its zero-length launch trailer. The most important change, however, was the new guidance system, called ATRAN (Automatic Terrain Recognition And Navigation). The ATRAN system, developed by Goodyear, matched the radar return of the surface with pre-preprogrammed radar images, thereby enabling the missile to follow a predetermined course. ATRAN was essentially the first application of the modern TERCOM (Terrain Contour Matching) guidance principle. The system was fully autonomous and jamming-resistant. The disadvantage, however, was the necessity to obtain radar images of the potential target areas, which was not an easy task in the 1950's. Flight testing of the YTM-61B began in 1956, and recoverable test missiles were designated QYTM-61B (the prefix - Q in front of Y - looks strange, but it is from official reports). Because the missile was significantly different from the original TM-61 Matador, the YTM-61B/TM-61B Matador B was redesignated as YTM-76/TM-76 Mace in early 1958. The production version was designated TM-76A. The first squadron of TM-76A became operational in 1959, and Mace soon replaced many existing Matador missiles. The TM-76B Mace B, development of which started in 1959, had an AC Spark Plug "AChiever" inertial guidance system instead of ATRAN. This allowed the Mace B to fly at high-altitude, which almost doubled the missile's range. An inertial guidance system requires the exact coordinates of the launch location. In the 1950's/60's, this required an accurate survey of the launch site which ruled out mobile use of the TM-76B. It was therefore based in fixed, semi-hardended shelters. As a compensation, launch times could be very short. The first TM-76B launch occurred on 11 July 1960, and the first operational missiles were deployed in 1961. In 1965, Secretary of Defense Robert McNamary decided that the Army's MGM-31A Pershing missile should replace the USAF's Mace, mainly because of the Pershing's high-speed launch ability. By 1966, the MGM-13A had been withdrawn, and by 1971 the Mace was no longer in active service. The remaining missiles were used as full-size target drones. As such, the MGM-13A was redesignated MQM-13A, and the CGM-13B became MQM-13B.